We have some amazing leaders in this city. We have a passionate mayor, city councillors, and staff who work long hours to create the best possible environment for our city to thrive. 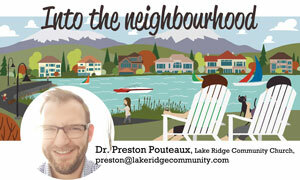 There is one thing I believe each of them would agree on: it’s the daily interactions between neighbours here in Chestermere that help set the tone for the future of our city. Bylaws and services do a lot, but they only go so far. They create an environment for good things to happen, but it really takes a each person – it takes you – to create the kind of city we wish to have. I hear stories of so many people who are stepping into the action and demonstrating that they want healthy neighbourhood life in our city. We’re discovering that competent neighbourhoods are not simply a value-added commodity, something incidental that may or may not be part of the ethos of Chestermere. Rather we’re seeing that creating healthy neighbourhoods serve as the backbone for almost everything we do. Our neighbourhoods shape what we become. It didn’t take a heartbeat for us to make our choice. With the sound of laughter all around, we made the choice: our street would put kids first. The decision was made, we wanted the kind of neighbourhood where we’d let kids play and as adults, we’d work together to look out for each other. Done! Just yesterday as I went out to get the mail and a kid on a long skateboard zipped by on his belly. I asked him about it and he showed me a couple tricks, telling me about how he got his treasured board. As I turned back to my house I saw my own one year old was wandering on our lawn and three more kids were tossing a ball around a few doors down. Neighbours are starting to wave at each other and locals slow their vehicles to a crawl driving through our quiet side street, pleased to make sure everyone is safe. We are setting a pattern of neighbourhood life that could shape the way kids and families interact and care for each other for years to come. This is what a beautiful city can feel like, and I’m delighted to call it my home. Who do you think set the ‘tone’ for your neighbourhood? Is your street the kind of place where people connect, look out for each other, and have fun? This week think of simple ways you can make your street the kind of street you want.